Ryan is AWESOME! A good friend recommended Ryan and I am thrilled she did! I recently adopted an 8 month old pup and had Ryan come as soon as I got him. I wanted to start our journey on a positive note...and I have because ofRyan.Ryan is extremely knowledgeable. LOVE the way he teaches and the practice of disicipline that Bark Busters implements. LOVE that he comes to you, to your dogs environment.Ryan helped not only with training, we spoke at length about proper nutrition and exercise habits.Ryan answered all of my questions and was totally reassuring. He has been totally available by text or call since our session to give advice and help with my concerns.I would totally recommend Ryan and Bark Busters! Ryan Brown enabled our dogs to change 180* in just a day's time. Our home is no longer such a stressful environment. Highly recommended! Ryan is awesome! He showed us how to handle my son's very anxious German Shepherd. Worth the price to get it done right! Ryan has been a great trainer and has helped us out a lot. Our two dogs used to fight constantly and we were thinking we may have to re-home one of the dogs, but Ryan came to the rescue and helped us resolve the fighting issue. We can't thank him enough and highly recommend his services! Ryan was our trainer and he is awesome! He was patient with me and my pup and showed me some effective techniques to help me communicate with my dog more effectively and it has been great! I highly recommend for anyone trying to get a closer bond and more confidence for you and your pup. Most people over-complicate training because we are much more complicated than our dogs. When you simplify the communication process, training can happen so much faster because the dogs just get it. Hi, my name is Ryan Brown and I am your local trainer here in the Pikes Peak Region. I am a fourth generation Colorado native and I love helping dog owners understand why dogs do what they do and how to fix the issues they need fixed. I have spent almost 15 years with Bark Busters training over 4,000 dogs (and their owners) in and around Colorado Springs. Before Bark Busters my wife Erin and I had an Anatolian Sheperd mix named Jesse. She was a nuisance barker and a “D” dog on the behavioral rating quiz. We received several barking complaints from the Humane Society. We thought we were doing everything right, but obviously we weren’t. Erin and I needed to be trained as much as (if not more than) Jesse. After training with Bark Busters, Jesse became an “A” dog and the barking was no longer an issue. My job is to teach you how to communicate with your dog in a way that he will understand. I also instruct you on how to be your dog’s teacher. Dogs are amazing “people” trainers. Because of this, they often think that they are in charge and see us as the students. The vast majority of our clients see huge improvements in their dog’s behavior in just one visit! Not only is the training fun, but it’s empowering to understand why dogs do what they do and how to fix the problems yourself. Any age and any issue, from house training to serious aggression and separation anxiety, we are the best in the business. If you and your dog need help, please give us a call today. Help can be on the way soon! Written: Clients receive a written, signed copy of the dog training guarantee on their Bark Busters receipt which is an official Bark Busters Australia document and outlines all the training methods which must be adopted to resolve your dog’s behaviour problems. Backed Up: The Bark Busters guarantee is backed up by the world’s largest dog training company. Copies of all guarantee receipts are retained at Bark Busters’ Australia & New Zealand Head Office. Service Guarantee: The Bark Busters guarantee simply states that if the owner continues to carry out all of the training instructions provided by the therapist at the training lessons, the Bark Busters therapist will continue to work with the owner, to achieve the desired results, for either one year, or the life of the dog (depending on the service obtained) at no additional charge. Most clients prefer the lifetime support guarantee because they receive peace of mind for very little additional cost. All Problems Covered: The guarantee provides for ongoing, free assistance no matter if the same problems recur, or if new problems arise. There is never an additional charge when your trainer returns, except for transportation costs if agreed in advance in certain areas falling outside the geographical area covered by your trainer. Guarantee Moves With The Dog: If for any reason the dog needs to be re-homed, the remaining term of the guarantee passes to the new owner for a nominal fee. In the case of the lifetime support guarantee, the new owner will be trained and will receive the benefits of the guarantee for the life of the dog. The one-year guarantee applies if the re-housing is done within the first year. Clients can upgrade to the lifetime support guarantee for an additional charge. Guarantee Moves With The Owner: If the owner moves to another location, the guarantee continues to be valid, either for the life of the dog, or one year from the date of the first lesson, depending on the service. If there is a Bark Busters therapist reasonably close by, services will be provided at no charge. If a trainer is not close by, Bark Busters will provide assistance by phone and email. People who move to parts of the world where Bark Busters has offices, ongoing assistance is also covered at no additional charge. Over 27 Years of History: Bark Busters has grown to be the largest dog training company in the world, with over 1 million dogs trained. The guarantee has been part of the company since 1989 when company founders, Danny and Sylvia Wilson, decided that it would help to significantly reduce the number of dogs that were being euthanised and provide customers peace of mind for many years. The company is expanding rapidly internationally and can be counted upon to fully honour its guarantee. I am your local trainer here in the Pikes Peak Region. 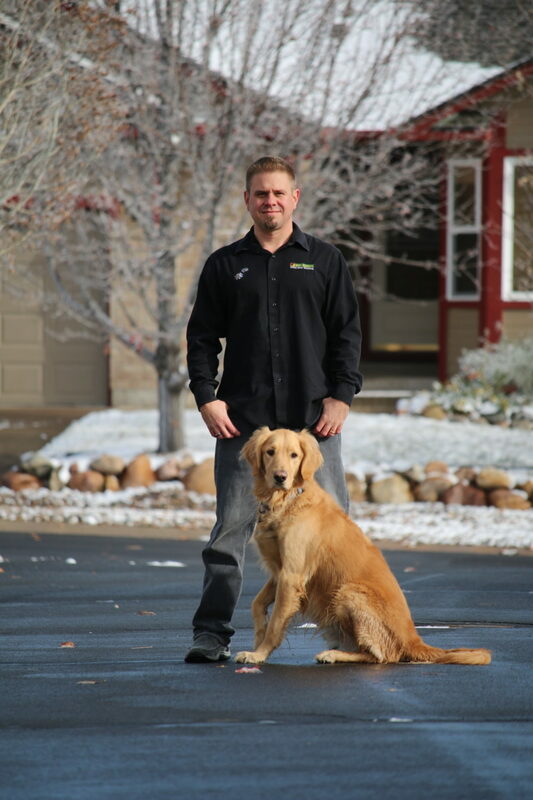 I have spent almost 15 years with Bark Busters training over 4,000 dogs (and their owners) in and around Colorado Springs.